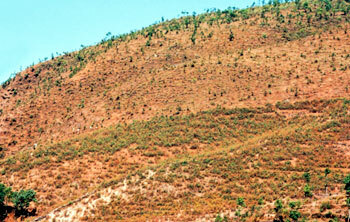 YESTERDAY AND TODAY: The barren, arid hillside in Dandapakhar in 1975 (above) and in 2005 below (SDC). For everything that goes wrong in this country, our leaders always have someone to blame. Usually it is some opposition figure, an invisible enemy or the foreign hand. But it is clear we don't need outsiders to bring the nation down, we're doing pretty well by ourselves. The Ministry of Forests and Soil Conservation is preparing to amend the Forest Act of 1993, which if endorsed by the parliament, would effectively demolish Nepal's successful, and globally-recognised community forestry program. 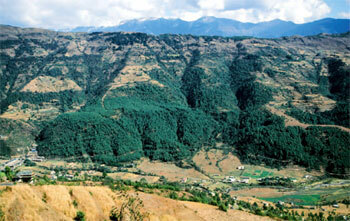 A quarter of all forests in Nepal are managed and protected by over 17,000 community forest user groups. But fearful of losing control and tempted by profits from the timber trade, the amendment proposes new restrictions that would undermine the fundamental principle of community forestry: manage local resources through grassroots democracy. Communities have been running health posts and repairing bridges from proceeds of the forests they have protected. The government wants to take that money away from them. The amendment will restrict community forests to only those areas which cannot be developed as 'block' or 'collaborative' forests. There will be limits on the maximum area for community forests, user groups will not be able to fix rates for forest products anymore, and they will have to pay half the proceeds from sales to the state. To top it all, communities will be at the mercy of DFOs (district forest officers), who have acquired a well-deserved reputation for corruption, to renew their operational plans. The ministry says it had to act because there is illegal logging in community forests. But there are plenty of examples of how the forests are the first to go if the state gets involved. User groups throughout Nepal have proved that they are perfectly capable of managing forests, raising local living standards, and protecting watersheds. Bringing in a corrupt and callous state is to guarantee the destruction of Nepal's forestry success story. To be sure, the philosophy of community forestry has never really caught on in the Tarai, and the prolonged political transition has tainted some user groups. Illegal logging has been reported mostly from the Tarai districts which account for 5 per cent of community forests, and in the midhills in some forests which were in the process of being handed over. But corruption in a few villages is no reason to dismantle the entire program. If the government really wants to control illegal logging, why not go after corrupt ministers who have amassed wealth in 'pre-paid' transfers of DFOs and local groups who run protection rackets? A well thought-out government propaganda is in place to prove that community forestry has failed in Nepal and is being fueled by local media and pseudo experts. 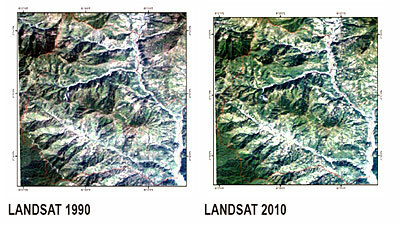 Landsat images taken in 1990 and 2010 of Sindhupalchok, north of Kathmandu, showing growth in vegetation due to community forestry (HELVETAS). A study conducted by the Swiss group, HELVETAS, however, has shown that there is 33 per cent more forest cover in Dolakha district than 20 years ago, and the growth of canopy cover in community forests was double that of government or privately owned forests. Unlike what the ministry wants us to believe, the model remains a success. User groups across the country have built schools and roads with the profits of the forest and an obligatory provision to reserve half the membership in user committees for women and disadvantaged communities has made local democracy more inclusive. It is not hard to see who benefits from the smear campaign against community forestry. They are the same crooks who plundered Nepal's forests to near extinction during the Panchayat, and are now eyeing the savings of user groups that run into billions. The new legislation is a case of medicine being worse than the disease. If the government is really serious about saving Nepal's forests, it should stay away and leave them in care of the communities. 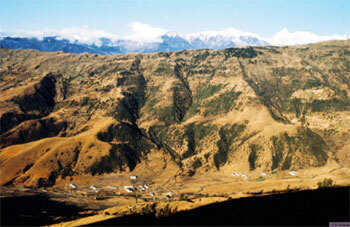 The hills of Kavre, Sindhupalchok and Dolakha used to be barren in the 1970s. But after the community forestry initiative took hold in the region, the districts have been transformed. This dramatic change is illustrated in a new book published by the Swiss Development Cooperation (SDC) to mark 50 years of being in Nepal, Kathmandu to Jiri: A Photo Journey. 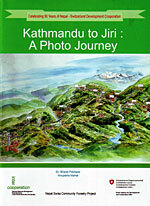 This book consists of 19 pairs of before and after photos that clearly show changes in landscape over three decades along the highway from Kathmandu to Jiri, and what is most striking is the increase in forest cover because local communities and forest user groups have been protecting their forests. The book also details how forests have helped agriculture by preserving watersheds, protecting the mountains from landslides, and promoting tourism. Nepal's community forests survived the war, now they are threatened by peace. Why are you surprised? The Maoists (and for that matter, sadly, UML and Nepali Congress too, don't like anything that is organized outside their politburo/central commitee chain of neo-feudal command that would militate against their capacity for rent-seeking. See how they destroyed community irrigation, community water supply and now community electricity as well! Admit it: loktantra is really loot-tantra and stop being 'surprised'! Spare us the phony 'outrage'. Is not Baburam Bhattarai our Cato the Elder? His sayings are the repetition of Cato the Elder. "Carthage delenda est." or "Cathage must be destroyed". The city was sowed with salt or not? Baburam is "the Messiah ". Wis men learn more from fools than fools from wise men. An angry man opens his mouth and shuts his eyes. The country is getting raped every day. Ha ha ! Nonsense why remote hills are greener, Cause no one lives or no one likes to live in remote areas. See the cities how crowded, no greener part. Thanks Rubeena jee for the News..
Community forest was merely some bunch of firewood for the local people, they saved so much in these years that it shines like a bullion..
Conservation is nothing else but a good sale for future..TRUE! SAD but TRUE..its always these political Street DOGS..who knows nothing else but A BONE! Its Dust everywhere and we complain for a stain in the shirt! There is no doubt what the government is trying to do with this act. What I'm surprised is that how little this issue is being raised and discussed in Nepali media. What about NEFEJ? Thanks Nepali Times. Also, has there anything been or being organized against this act before it passes the house? If there is please do let us know. Thanks. how come my previous comment isn't uploaded? The Community Forest User Groups all over the Nepal are not doing wrong practices. It is a reality that the local communities have been successful in conserving their forests. But, now when they want to harvest and sell the forest products, the Govt seeks to get tax from the sale of forest products, so that those people who are not users of the forests but are only civilians of Nepal, could also be benefited, and the Govt could function well. From this perspective, the Community Forest Users Groups and the pro-CF activists should support the govt action of amendment of Forest Act. The Govt. felt only after about two and a half decade of CF that it should not have provided with hundred percent benefits to the local community. Rather the local communities should be given certain percentage of the Govt property. But it has become too late. First providing full benefit, and then proposing for share of benefits, has created problem. But the CFUGs, FECOFUN, and activists should understand that if all the local people should get all the benefits from local resources, then how the govt could run, and how those people who are not users of CFUGs could be included. The CFUGs have not been inclusive in all parts of the nation. It has excluded the distant and marginal communities in many parts of the nation. So, it is the responsibility of the Government to think for those marginalized and the distant/excluded people, who also deserve facility from the government property. If all the local resources are claimed by local people, then, if the people living in boarder areas nearby China or India, claim for all the income of the tax and duties of custom office, then how could the govt solve the problem. In the Govt property, the right of the entire civilian should be equal, and therefore, all the people should benefit equally. Those people who have conserved the community forests, certainly deserve greater proportion of the benefits, but still those who are farther from the forest, should also have the stake in the Government property of CF. It is not fair that the users of the CFs should get the timber of Sal and other species at very low cost (NRs40-50 per cu.ft. ), whereas those people living in Kathmandu or other parts of the nation, who have not got membership of any CFUGs, need to pay high cost (more than NRs. 5000 per cu.ft.). The Govt as well as the CFUGs and the activists should think over this issue. The distant people of Tarai have always been excluded, but have only been recently included in the Collaborative Management of Forests (CFM) in some districts of Tarai. The people of southern Tarai were never informed about the state's policy of CF, and the forests were handed over to the encroachers of the forests, whereas the traditional users up to the India boarder were intentionally excluded. The donor projects of CFs were only concentrated to the mountains and hills of Nepal, who never take care of the stake of the distant users of Tarai. Therefore, it is not fair for the people of Tarai as well. It is not true to say that only the efforts of local people have been able to conserve the forests in the CFs; but the forest officials and the donors have also played significant role directly and indirectly. And at present time, not only some forest officials but also some members of the CF users groups are corrupt, and therefore, blaming only the forest officials and declaring them all corrupt, is not fair. In the news' article, it is quite misleading that the people have been managing their forests very well; but instead they have only been able to protect their forest at the cost of nearby national forest, of which they have not been provided use-right under the jurisdiction of CF, ie., the govt. managed forest. Protection of forest is not the management, but it is the application of management prescriptions. The people may have the capacity to manage a block of forest, but how much area can be managed a community should have to be analyzed based on some rational norms. For example, one household in the hills may need 2-3 hectare of forest to fulfill their basic needs, as well as the household can manage that area. But if a large area of forest is handed over to a community of relatively lesser number of household, the forest could not be managed by the community. Therefore, assessing the management capacity of a community is a very difficult task. Therefore, handing over a large chunk of forest to a small community or vice-versa could not be scientific. Therefore, the amendment in the Forest Act, which is being proposed at present time, has proposed handing over forest area on the basis of the size of the community. Also, it is mentioned in the news article that "communities will be at the mercy of DFOs (district forest officers), who have acquired a well-deserved reputation for corruption, to renew their operational plans". This is a very negative way of expression, and I personally condemn this. The CFs has been promoted by DFOs in the past and present as well. DFOs have never acted against the promotion of CFs. Where there have been cases of corruption, it must be by the involvement of the user committee members. So, blaming the DFOs and their staffs is a very biased way of thinking. All these problems have come when the forest stock have reached the stage of extraction, ie, when benefit is coming. The users groups of CFs as well as the forest officials have wrong motivation of taking more benefits than what should be taken sustainably. 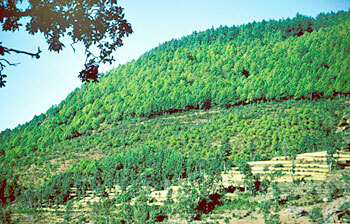 In many cases of Tarai CFs, where well grown forest (stocked forests) have been handed over, the users have only the intention of harvesting the forest without caring for the condition of the forest, and making as much benefit as possible, without even caring for the needs of the local people of the district who are deprived of the forest products. Most of the CFUGs have the intention to sell the forest products outside the district through tender process, without fulfilling the demand of the nearby users and the people of even the same district. This has raised frustration within those people who are not getting even a small piece of wood, whereas the users of CFUGs are burning the wood of Sal as fuelwood in nearby areas of forests. Therefore, if the needs of the excluded is not addressed, the issue will explode the forestry sector in the Tarai and the higher Himal areas. We should be proud of the achievements of the CF programme, but we should address the issues in the coming days. The proposed amendments in the Forest Act, 2049 should be discussed among various stakeholders, but it should not be blindly blamed. Also, the roles of the forest officials and the Govt should not be under-estimated and undermined. The pre-occupied thinking of FECOFUN and other NGOs and activists to always resist the government and forest officials should be analyzed through positive thinking. An unbiased discussion among various stakeholders is necessary to come to any conclusion. The media people should not publish such a biased article. Thank you! It is a tragedy that even after two historic People's Movements public perceptions about the nature of the Nepali State remains pretty much the same. We are still ideologically motivated and nurtured to view 'state' vs. 'communities' as if the 'two' are fundamentally diametrically opposed to each other. How can communities exist outside the frame of a state, or how can a state be a state without the communities? Aren't the state representatives elected by the communities themselves in a democracy? While I appreciate the success story of the Community Forestry programs in Nepal, (thanks to the public policy initiative taken by the State), I disagree with the notion that the communities should be left "free" and entirely on their own whatever they wish to do with the critical natural resources. I see a sort of organic analogy between 'state-communities' relationship and the 'body-organ systems' relationship. Just like the human body cannot survive unless the organ systems are coordinated and functioning properly, so can't the state without harmony between communities. A coherent overarching policy on the planning, production and utilization of all kinds of resources, including forestry, would therefore be beneficial for 'both' the state and the communities. A dynamic equilibrium between the 'two' are essential for the success and survival of democracy and society. Only through further empowering the local communities-- to the extent of granting constitutional rights to call back their elected representatives should the latter work against the vital interests of the former-- can the 'center-periphery' problem be effectively addressed at a systemic level. Perhaps the writer and I stand at the same page in this regards. Some thing that works should not be tampered with. In a country where things have not been functioning on most fronts, if gains in forestry remains a laudable point then we should stick to it. What is harm in giving all the benefits to the community itself? They deserve it. Anyways, the successive governments are not able to give them their basic dues. People should not find ways to feed the corrupt leaders and the malicious bureaucrats (not all). For a change, let the people have a feast. Hills have become greener as maoists and other jungle people (present and future) grew them up to secure their hiding places. Those forests are full of deadly animals (them).